Cooking up Change Goes Waste-Free! For the first time, I am pleased to announce that Healthy Schools Campaign’s annual fund raiser Cooking up Change is going waste-free! We'll be joining the ranks of organizations including the U.S. Green Building Council and Seven Generations Ahead in making our event waste-free. Waste minimization, elimination and recycling are easy when you are talking about bottles, cans and paper. The biggest challenge in holding a waste-free event is what to do with things such as food waste, tableware and trash can liners. 1) Donating untouched food waste: Fortunately, at Healthy Schools Campaign we rarely have any leftover food -- since it is sooo good, and we have so many deserving staff and volunteers ready to take this nutritious, delicious food home to their families and friends. In the event that there is any untouched food, we will be working with a local organization to donate the food so it is not wasted. 2) Using bio-based tableware: We will be using tableware made from grown or recovered plant fibers including corn, sugar cane, bamboo or rice. 3) Composting: Using bio-based products alone is better than using petroleum-based products, but if they are not composted they will essentially not break down in a conventional landfill. Thanks to the Resource Center of Chicago, our food scraps and food service items -- including compostable trash can liners -- will be hauled to a permitted composting facility and turned into a nutrient-rich soil. With growing interest in composting from schools and businesses due to the rising cost of waste disposal, we hope to be piloting off-site food composting at several Chicago schools as more facilities become permitted to handle food waste. Food waste makes up the largest component of a school’s waste stream, so finding an environmentally responsible means to offset waste disposal costs just makes sense. What’s really fun for me is seeing the effect that we’ve had: people know about our work and are letting us know that we’re really helping change the marketplace. When you walk around the floor here (it takes about 15 minutes to walk from one end to the other – it’s huge!) you know that the market is shifting because everything is going “green.” Our challenge is to make sure we sort out what is truly green and what is “green washing” and make sure schools know how to choose better products to truly clean for health. Of course, we promote state policy to encourage green cleaning, and as we talk to people here at ISSA, there is a lot of interest in joining our efforts. On Nov. 12, we are bringing together state advocates and national partners in Washington, D.C. for the Green Clean Schools National Summit to share best practices supporting green cleaning legislation in states across the country. This is an exciting time to be part of the green cleaning movement because things are moving so fast. On another note, the National Collaborative Work Group on Green Cleaning and Chemical Policy Reform in Schools has also published a great new resource on green cleaning in schools. It’s a wealth of information on green cleaning with a ready to use presentation showing exactly how to green a cleaning program. A great addition to the work we’ve been doing. Click here to check it out. Finally, I want to thank all our sponsors because they’ve been such a support for our efforts. Without them, we wouldn’t be able to provide resources to schools or do the educational outreach that makes such a difference… Thanks! Apply for This Year’s Green Cleaning in Schools Award! If your school excels at green cleaning, get the recognition your staff and school community deserves! For the second year in a row, HSC will join forces with American School & University magazine and the Green Cleaning Network to present an award honoring those who show dedication and innovation related to green cleaning methods and practices. Winners will be profiled in a special issue of American School & University magazine. For those of us who have spent our careers in the facilities department, we often operate as though we are invisible. We want the occupants of our buildings to enjoy the benefits of a healthy, safe, clean, high-performing and even inspiring building, and we want them to do so without giving thought as to what it took to achieve this. The downside of this is that we often go unrecognized for the efforts we expend on behalf of our occupants and guests. One of the downsides of humbly working in the background is that it tends to limit our exposure to others, even in our own profession. As a result, innovation and true leadership is often slow to be recognized. Take advantage of this unique chance to spotlight your hard work. Applications are due by Sept. 12, 2008 – visit AS&U's site for more information and an application. For more on last year’s winners, click here. P.S. Get your free copy of The Quick & Easy Guide to Green Cleaning in Schools online at www.greencleanschools.org. California may be the next state to bring green cleaning to schools, following the lead of New York and Illinois. In April, the Green Schools: Environmentally Sensitive Cleaners act (Assembly Bill 2808) was approved by the education subcommittee. It will now be going through appropriations and then to the full assembly. You can track this bill on the California Legislative Information site. What Do VOCs Have to Do with the Air We Breathe? Indoor air quality (IAQ) in schools (and in any building, really) is affected by a huge array of factors that leaders in facility management and environmental health have been discussing for years; one of those factors that we’ve lately been hearing people talk about outside of the usual groups is VOCs, or Volatile Organic Compounds. So just what are VOCs and what is contributing to them in the indoor environment? In the Chicago Tribune article Breathing lessons: Furnishings, finishes, cleaning products add up to indoor pollution, Jeff Spurrier puts it simply: VOCs are any chemicals that at room temperature turn into gasses and mix with the air we breathe. Our lives already may be overloaded with acronyms, but get acquainted with one more: IAQ — indoor air quality. You probably will hear it much more in the years to come. Like climate change, IAQ is not a single problem. It's a construct, a dizzying mix of factors that may contribute to headaches, nausea and other health-related complaints. The growing concern about IAQ can be witnessed in the array of low-VOC paints, formaldehyde-free flooring and other products touting their clean composition. But green washing is prevalent, and the truth is that this problem — and its solutions — aren't as clear as marketing slogans might suggest. So what is in our homes that can give off VOCs and impair indoor air quality? Not surprisingly, they are the same sources that are found in classrooms and offices. VOC sources includes just about everything you will find in an interior space: paints, particle boards in bookshelves or cabinets, flooring systems, furniture, and let’s not forget cleaning products. Mold is also a source of harmful VOCs. Unfortunately, moldy materials are often ripped out and replaced with new materials that contain other harmful synthetic VOCs from the manufacturing process. So what can you do about VOCs? The best solution is to minimize furnishings containing VOCs in the first place. The U.S. Green Building Council LEED standard for schools recommends using furnishing products that meet the California Standards for low VOCs or meet the Green Guard standards. If you have an existing building and can’t afford a major renovation, consider increasing the amount of fresh air brought into your heating ventilation and air conditioning (HVAC) system to minimize the re-circulation of VOC-contaminated air. And finally, we should all remember to go for the low hanging fruit by switching to green cleaning and maintenance practices to stop the introduction of additional harmful chemicals into the indoor environment. Aren’t green schools just the best? If you aren’t convinced yet, check out this article from the School Library Journal that profiles green schools across the country. The article includes information from the early leaders like Fossil Ridge High School in Ft. Collins, Colorado to one of our favorites -- the Great Seneca Elementary School in Germantown, Maryland. In addition to saving money through more energy efficient building design, these school buildings are also reducing their emissions of carbon dioxide, one of the most significant contributors to global warming. Of course, energy efficiency is only one piece of the pie that makes for a sustainable school. The U.S. Green Building Council’s Leadership in Energy and Environmental Design (LEED) for schools also includes criteria for other important attributes such as sustainable site selection, water efficiency, sustainable materials and indoor air quality. From the relatively short-term benefits in energy savings to the long-term benefits of a better, healthier learning environment for students to reducing global warming -- we can’t afford not to go green. 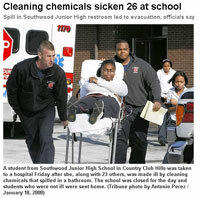 The Chicago Tribune recently reported a cleaning chemical spill at a school in Country Club Hills, Ill. The spill sent 24 students and two teachers to the hospital; 400 students were evacuated and the school was temporarily closed. Unfortunately, it is only through accidents like these, the ones that make headline news, that we’re alerted to the significant hazards of conventional cleaning chemicals. Luckily, we do not see evacuations caused by chemical spills happening on a regular basis; but that doesn’t mean that the indoor air is clean or healthy. We have come to associate the smell of bleach, ammonia or pine with what we think of as "clean." But the reality is these and most conventional cleaning chemicals are toxic. Even when used properly, they are respiratory, skin, and or eye irritants. Some conventional cleaning products can cause cancer and are suspected reproductive toxins. Mixing chemicals can produce a poisonous gas, as it did at the school that had to be evacuated in Country Club Hills. Advances in product formulations have resulted in the development of green cleaning chemicals that are cost-comparable and just as effective as conventional cleaners but are safer for health and the environment. Using these green cleaning products protects students and staff from emergencies such as the chemical spill; it also protects them on a daily basis from respiratory irritants (particularly important to the millions of children who suffer from asthma) and the cumulative effects of chemicals linked to long-term health problems. The best way to ensure the product is safe is to use third party certified products such as Green Seal, Environmental Choice, or Design for the Environment. And always follow the manufacturer’s directions. In light of cases like these, green cleaning seems like such a no-brainer that it makes you wonder why everyone is not using green cleaning practices. Perhaps the best explanation came from Superintendent Wendell Chu of New York, who explained that school administrators have so many pressing issues to work on every day that it took a law requiring green cleaning for him to realize how much sense it makes. With the law in place, he was able to make green cleaning a priority. As green cleaning laws are being implemented in Illinois and New York, students and staff will no longer be facing the daily adverse health effects associated with conventional cleaning chemicals and will be safe from the danger of emergency situations such as a chemical spill. In the other 48 states without green cleaning legislation, we can provide tools such as The Quick and Easy Guide to Green Cleaning in Schools to help facility managers understand the need for green cleaning not only for the wellbeing of their students and staff, but also for an effective, affordable and sustainable approach to cleaning that does not harm the environment. Everyone deserves to send their children to a school where students can breathe the air without having to worry about it making them sick. Even though green cleaning in schools is not required by law everywhere, breathing clean air in school should be every child’s right. One of the most exciting things we did in 2007 in the world of green cleaning was working with American School & University magazine and the Green Cleaning Network to launch the first Green Cleaning Awards programs. (OK, that was in addition to getting the Green Cleaning in Schools Act passed in Illinois, having great speaking opportunities around the country, and having a fantastic time at the ISSA/Interclean Trade Show, among other things. It’s been a busy year!) The winners are announced in a special supplement [pdf] of American School & University. I was thrilled to be able to bring some recognition to the hardworking folks who are truly dedicated to a healthy, sustainable approach to cleaning for health that does not harm the environment. So many schools are doing such great work that it was really difficult to choose the best. One thing that was clear in the applications -- and what we emphasize in The Quick and Easy Guide to Green Cleaning in Schools -- is that green cleaning is about more than just using environmentally preferable cleaning chemicals. This was evident with each of our award winners who incorporated the Quick and Easy Guide’s “Five Simple Steps to a Healthy School Environment” in their green cleaning programs. Remember that “Switching to Green Cleaning Products” is just Step One. At Mayfield County School District in Ohio, the district is using vacuums certified by Green Label and has furnished the schools with high quality floor mats. They also use Green Seal certified paper products. I was really impressed with the training program for their custodial staff. The staff attend a two-day training program accredited through their local community college. The vendor provides a follow-up one-day in-service training that covers the importance of green cleaning and its impact on the districts’ staff, students and buildings. At Hernando County Schools in Florida, the district also uses Green Label certified vacuums as well as color-coded microfiber cloths dedicated to specific areas. Hands down what won me over with this first place award winner was their constant evaluation and feedback program. They have systems in place for daily and weekly feedback from teachers and the administrator, and even have self-assessments for the custodial staff. The maintenance/custodial supervisor conducts inspections at the school through out the day and evening and provides reports to the head custodian, principal and executive director of maintenance. The reports allow everyone to see the achievements as well as areas for improvement. So, did you figure out all “Five Simple Steps”? Click here to find out if you got them all! Plus: If you don’t have The Quick & Easy Guide to Green Cleaning in Schools yet, click here to order your free copy! It’s time to share your comments on green cleaning in schools! We now have two opportunities to participate in the public process to shape guidelines that will affect how schools are cleaned in Illinois and across the country. What we are talking about are the revision to the Green Seal Standard for Industrial and Institutional Cleaners (GS-37) and the Illinois Guidelines for Green Cleaning in Schools. Both sets of guidelines were developed through a public process with broad stakeholder involvement, and are now available for public comment before they are finalized. When final, the ideas outlined in these documents will shape the way we clean schools and reduce children’s chemical exposures. Awareness of children’s additional health risks from chemicals and pollutants has grown in recent years . . . . Exposure to chemicals in the environment, including chemicals from cleaning products, can affect children differently and more severely than adults, for a number of reasons. As they grow and develop, children pass through critical windows of development, which are periods of susceptibility to chemical exposures. “For children, the stage in their development when exposure occurs may be just as important as the magnitude of exposure.” (WHO) In some critical developmental stages, even a single exposure event could lead to irreversible, life-long impacts. To view the revised standard and share your comments, click here. The comment deadline is January 16, 2008. The Illinois Guidelines for Green Cleaning in Schools draft is a result of recent legislation making Illinois the second state in the nation to make school environments safer and healthier through green cleaning. The Illinois Green Government Coordinating Council (IGCC) led the development of the guidelines through a collaborative process with a diverse group of stakeholders, including representatives from HSC. Now, the IGCC is seeking input on the proposed standards. You can share a general comment in support of green cleaning or can download the full draft and comment on specific aspects of it. The comment period is from December 8, 2007 to January 8, 2008. Comments can be submitted in writing on the IGCC website or in person at any of the three scheduled public meetings. Interested in learning more about green cleaning in schools? Order your free copy of The Quick & Easy Guide to Green Cleaning in Schools from HSC today! Last week, I had a conversation with Francine, a nurse who was caring for one of my family members. Francine is a hard working mother of two children at a public school on Chicago’s south side. As usually happens with moms, our conversation quickly turned to our children and school. Francine told me that her daughter, besides doing well academically, loved playing volleyball and cheerleading. Now, her daughter doesn’t have the chance to do either of these things. Because the test scores at her school were below a limit set by No Child Left Behind (NCLB) legislation, her daughter’s beloved volleyball, cheerleading, and other programs that were not core academic subjects had to be cut. My heart ached for Francine, her children, and all the children at schools that are being forced to eliminate the programs that light the fire in our children’s hearts. We know the research showing that physical activity supports academic achievement, and that healthy students are better learners. But I also know, with or without research to prove it, that P.E. is one of the main reasons my son likes going to school. How can we expect children to learn and have a good attitude about school when we deprive them of the activities that bring them joy? Instead, children like those at Francine’s daughter’s school spend hours on critical subjects without a break for physical activity or the sports they love, which have been cut because the school has failed to meet a standard that to the children must seem arbitrary. All children deserve the chance to be physically active, even if they happen to attend schools that – for a variety of reasons that almost always include limited resources – do not meet NCLB standards. We know well the role that sports and exercise play in children’s health and well being -- for a few children, it provides their motivation for getting up in the morning. Let’s not take that away. The Center for Disease Control has released a new study, Healthy and Safe School Environment Part II, Physical School Environment [pdf], which details the status of school environmental health throughout the U.S. The study provides background information and specific citations on the health vulnerabilities of children and the health risks they face at school: those associated with indoor air quality, diesel exhaust from school buses, hazardous materials, pesticides, drinking water and lead. The bulk of the study is a nationwide survey of the environmental practices that affect children’s health, at the school level and the school district level. It’s great to see this type of large-scale study recognize and examine the issues that we know are important to children’s health and readiness to learn. This type of broad data shows how much work remains ahead of us all in our efforts to provide healthy school environments for all students, teachers and school staff. But it also highlights the substantial good work that is being done around the country to make schools safer, healthier places. The survey found that one third of districts have an indoor air quality management plan; more than one third have a school bus engine-idling reduction program; most districts and schools have plans for how to store, dispose of, and reduce the use of hazardous materials. One fourth of states require schools to follow an integrated pest management program, reducing the misuse of pesticides. Although we still have a long road ahead to making America’s schools green and the buildings safe for all children and teachers, it looks as though we are heading in the right direction on that road. This week marks the 50th anniversary of federal troops' arrival in Little Rock, Ark., to ensure equity in education for nine African American students. Sadly, so many years later, huge disparities in public school construction funding still exist. The fact that such tremendous disparities persist is, in a word, shameful. This lack of adequate school construction funding has resulted in a situation where students in low income and minority communities spend their days in deteriorating buildings that adversely impact not only the students' learning, but also their health and the health of the staff and teachers who work in their schools. Two organizations, The 21st Century School Fund and Critical Exposures, have done an excellent job of highlighting these disparities in very different ways. Both point to the need for federal and state policies to narrow this gap. The 21st Century School Fund formed a group of local and national organizations, Building Educational Success Together (BEST), to investigate and research this issue. Their findings are well documented in the report Growth and Disparity: A Decade of U.S. Public School Construction [pdf]. School districts with predominately minority student enrollment spent the least ($5,172 per student), while school districts with predominantly white student enrollment spent the most ($7,102 per student). If you have never seen one of the schools affected by the worst of these funding disparities, you can take a virtual tour through Critical Exposures’ gallery. Here you will see the same issue through the camera lens of the students. The pictures speak for themselves. Most of us would never dream of working in buildings like these, yet so many of our nation's children are spending their days in them. When and if the children graduate, they are expected to compete with students who have attended state-of-the-art schools in affluent communities. If we want all students in this country to achieve academically and participate in civic life, then we must provide them with the buildings, teachers and resources to do so. Eliminating the disparities in school building quality should be an integral part of closing the achievement gap, and should be an explicit objective of state and federal educational law, including No Child Left Behind and other funding sources. Although this school was less than 50 miles from Washington D.C., it was a world apart in every way from the inner city school I visited nearby and discussed in an earlier blog. From the outside, the school didn't appear to be much different from any other newly constructed suburban school--but when we stepped inside and took a closer look, I was amazed at what I saw. The first thing we noticed was how bright the rooms were and how comfortable the air temperature was. Even though it was a sweltering July day, inside the temperature remained a comfortable 75 degrees without the use of air conditioning. The rooms were filled with soft natural daylight. When the outside temperatures reach extremes, the school is equipped with a geothermal heating and air conditioning system that in the summer cools the air to 65 degrees at a fraction of the cost of conventional air conditioning systems. Around the school are display signs used to teach students, staff and visitors about the green features in the school. The signs explained every detail: that the restroom partitions are made from recycled plastic bottles, the cabinets are made from wheat straw (a rapidly renewable resource), and that the toilets have dual flushing modes. Besides these impressive features, one of the most interesting things we learned was how this school made an impact on the community. The school replaced two other schools that were merged into one. Since its completion, the school has really been embraced by the community and has become a place where community members want to come, volunteer, and be a part of the children’s education so they could help make things even better. This was a great experience and such a beautiful school -- but you don't have to take my word for it. To learn more, join us at our Lunch and Learn on Green Design in Action on November 6, where Anja Caldwell, Green Building Program Manager for Montgomery County Public Schools and "proud parent" of Great Seneca school, will tell us more about the green features of this school and Montgomery County’s vision for green schools in the future. The D.C. school, built in the 1950s, is typical of many inner city schools in low-income minority communities. Outside the school, the windows looked as if they had not been cleaned since the school was built. Soot, rust and bird droppings created a film over everything. Litter was scattered nearby and a dumpster was located so close to the entrance that we could smell rotting refuse as we entered. Just as the students do each school day, we passed through a metal detector before being allowed to enter the building. Inside, the air was hot and stuffy –- the building seemed to have absolutely no ventilation. A trip to the roof proved that the air conditioning system was indeed operating but was in such poor condition that there was no fresh air was going into the building. Bird droppings and what appeared to be mold or algae covered the outside of the unit. The top floor of the school held a multi-purpose room of just about 1,000 square feet that also served as the library, resource center, computer lab and instructional area. About half of the ceiling tiles showed water damage even though they had all been replaced a year ago. And of course, where there is water damage, you will find mold. We entered one classroom that had been closed off to students because water was forming a pond in the center of the room. The mold in the room forced one of the training participants with asthma to leave the building. Water problems also plagued the basement, where the kitchen and cafeteria were located. Evidence of mice and roaches was easily visible in the kitchen and cafeteria, as well as in the classrooms. The school had no elevator to accommodate children with disabilities. We were told that students with mobility impairments must be carried by a staff member up and down the stairs. The administration office, while dry, was hot and stuffy and lacked proper ventilation. In spite of the poor condition of the building, the staff dedication at the school was clear. Staff made the best of what they had, and took pride in providing a place where children could learn and feel safe from violence outside the school. The sad truth is that school conditions like these are not uncommon, especially in low-come minority communities. The tour was just one small reminder of how tremendously important it is for us to continue working to improve school environments for all children. In next week’s blog, I’ll tell you about our tour of the school at the other end of the spectrum: the first LEED-certified school in Maryland. Many teachers will breathe a sigh of relief when they hear a Montgomery County Md. jury determined that a teacher who became ill from exposure to toxic mold in a portable classroom is entitled to worker’s compensation, as reported in this Washington Post article. Classifying this teachers' illness as an "occupational disease" is a major step forward in acknowledging the serious danger of poor indoor air quality in schools. For years, teachers have been reporting health problems and their concerns with the indoor air quality in their schools, both in portable classrooms and traditional school buildings. For the most part, school administrators and those in the medical profession have not recognized the seriousness of the problems that indoor air quality causes for teachers. Teachers suffering from medical problems resulting from poor indoor air have been accused of fabricating their stories and some have even been referred for psychological evaluation. In reality, the conditions in many classrooms pose significant hazards to teachers as well as to children. Portable classrooms are notorious not only for their poor ventilation - which can cause toxic mold growth, as in the Montgomery County case - but also for construction materials that contain high levels of volatile organic compounds (VOCs). They also have inefficient heating, ventilation and air conditioning (HVAC) systems that are so noisy that many teachers choose not to use them, reducing the ventilation even further. The EPA also provides information to help with the indoor environment of portable classrooms. Although it's great to hear that a jury recognized the seriousness of this issue and is taking steps toward compensating the teacher who has suffered, I hope that soon we'll be hearing more about steps that schools are taking to improve indoor air quality and prevent teachers from experiencing this type of occupational illness in the first place. To learn more about indoor air quality and school environments, check out our action and resource guide. Healthy Schools Campaign is pleased to announce American School & University’s Green Cleaning Award program, designed to recognize the outstanding efforts of schools around the nation to move forward with green cleaning. We know that green cleaning reduces chemical exposures for children and adults, protects the health of staff who work closely with the cleaning products, extends the life of buildings, and even protects our environment. Now it's time to recognize the people who are embracing these concepts at schools. American School & University's Green Cleaning Award, created in conjunction with HSC and the Green Cleaning Network, honors schools and their partners that embrace green principles and practices. Awards will be presented to exemplary programs and winners will be profiled in a special supplement of American School & University, a monthly magazine for education facilities and business professionals. Steve said that a similar award program launched by American School & University has become the "Academy Award" of school design, so we have high hopes for this award program and are eager to encourage schools to apply. Learn more or submit information about your school's green cleaning program at the American School & University award page. And if you don't already have your free copy of The Quick & Easy Guide to Green Cleaning in Schools, click here to order it today! After years of dwindling school budgets for building maintenance, renovation, and improvements, the importance of America’s Better Classroom Act (H.R. 2470 in the House and S. 912 in the Senate) has never been greater. According to government estimates, 43 percent of America’s public schools have at least one unsatisfactory environmental building condition. Mold, leaking ceilings, pest infestations, hazardous chemicals, and overcrowded classrooms are just a few of the unsafe conditions that create health risks to students and staff in tens of thousands of old and new schools across the nation. America’s Better Classroom Act would address these unhealthy conditions. The bill allocates $25 billion in bond authority for special local school construction bonds that could be used for public school construction, rehabilitation, building repair, or the purchase of land on which to build a new public school. The federal government will pay the entire interest on these bonds, a subsidy worth up to 40 percent of the cost of the bond. The decision about the use of the bond is up to the local authorities. We support this effort but would love to see a requirement or some type of incentive for building schools which are energy efficient and promote a healthy environment. Healthy, energy-efficient schools are better for the students and teachers, protect the environment and have lower operational costs. Ask your senators and representative to support America’s Better Classroom Act to help make our schools healthier and safer places to learn and work. It’s O.K. to Spray? Is this a joke? The Consumer Aerosol Products Council is running a contest for children and teachers entitled "It’s O.K. to Spray" on the pretext that since CFCs have been banned for most aerosol products, there is no problem with using aerosols. Promoting the use of aerosols to children sounds like a bad movie stunt, not something that teachers or school administrators would take seriously. But the group records years of participation, including a recent rally where students sprayed aerosol cans and urged listeners to "Hey, spray! It’s okay!" We love the idea of teaching kids about science and the environment. Getting kids and families involved and enthusiastic about chemistry and its applications to our world is definitely a good thing, and it’s commendable when students and teachers really explore an issue and present their findings to the community. But when corporations provide funding to schools with the goal of promoting products that can be dangerous to children – and do so under the guise of environmental education – that’s a problem. Although it may be true that aerosols now constitute a minor component of outdoor air pollution, the indoor air environment is an entirely different story – with dangers for children that definitely aren’t a joke. According to the EPA, indoor air is typically 5 to 10 times more polluted than outdoor air and is frequently up to 100 times more polluted. So why would anyone contribute to indoor air pollution by spraying an unnecessary aerosol? Aerosols and indoor air pollution are especially dangerous, of course, when children are involved. When chemicals are aerosolized, the sprayed particles are so small that they can become suspended in the air for an extended period of time, allowing them to be inhaled deeply into the lungs. In proportion to their body size, children breathe more air than adults – so they are absorbing more of the chemical from the aerosol canister. Children are also more vulnerable to the pollution because their bodies are still developing. Many chemicals that adults can absorb in small quantities without major risk – chemicals such as lead – can cause serious harm to children’s development. For children and schools, the other major issue to consider is asthma. Asthma is the leading cause of student absenteeism due to a chronic disease and has almost doubled in the last 20 years. It is unconscionable that any group would promote exposing children unnecessarily to aerosols that may trigger an asthma attack – much less encourage children to needlessly spray aerosols and chant that it’s "okay!" From an environmental perspective, aerosols – even without CFCs – serve as highly inefficient delivery mechanisms for chemicals, leading to unnecessary waste and product transport. When it comes to cost, aerosols are dramatically more expensive and less efficient than their non-aerosol counterparts. The amount of chemical dispensed in one $3 can of aerosol, for example, is equivalent to an amount of concentrated chemical that can be diluted and applied with a spray bottle at a price that ranges from 2 to 20 cents. Promoting learning about the environment is important. But promoting children’s use of aerosols in a manner that could pose risks to their health is simply irresponsible – and not a joke at all. As part of a recent package of stories on global warming and green living, the San Francisco Chronicle looked at steps that schools are taking to go green. Ultimately, all this provides a healthier learning environment, which in turn improves student learning, educators have found. As an added bonus, energy costs go down and the Earth is better off. "I think that (schools) are realizing being green can save them money and help them improve test scores," said Deborah Moore, executive director of the Berkeley-based Green Schools Initiative. The green schools movement, however, is fragmented, with individual schools or districts addressing energy waste and environmental inefficiency in schools, but few statewide efforts doing the same, Moore said. "Schools, like any other institution, use lots and lots of resources," she added. "That means there's a big potential for savings there." The story includes links to a number of helpful California-based organizations and resources. All of these efforts reach far beyond the school walls. As "going green" become incorporated into classroom instruction, the next generation is taught to be stewards of the environment as well. Earlier this month, while exhibiting at the American Association of School Administrators annual conference on education in New Orleans, I had the opportunity to speak with several school superintendents about green cleaning. One of them was Wendell Chu, the superintendent of the Fire Island Union Free School District in Ocean Beach, N.Y. He told me that before they started their green cleaning program, a teacher with chemical sensitivities used to always get sick whenever heavy cleaning was done. Since they started the green cleaning program, there have not been any reported absences or problems due to the cleaning products. He also remarked that they have had information on green cleaning for a long time, but superintendents have little time to focus on it with so many other issues they are working on. It took New York's green cleaning legislation to make them do it. But once they implemented the program, there was a sudden "Aha"' moment. "It made so much sense, there was no reason to not do it before," said Chu, "but it took the legislation to make us start thinking about it and implementing our program." As advocates for green cleaning, we often hear the argument that if green cleaning is so great, and some schools are already doing it anyway, why should it be mandated? Thank you, Superintendent Chu, for answering that question.